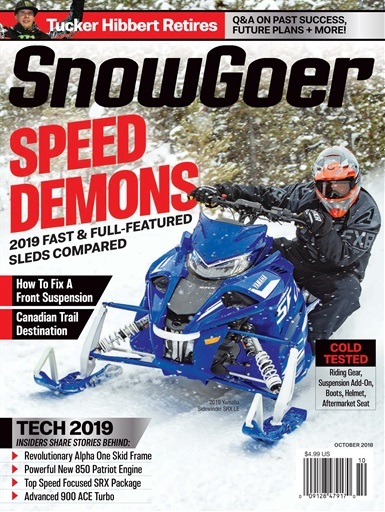 Check out the October 2018 digital issue of Snow Goer magazine to compare the Arctic Cat ZR 9000 Thundercat iACT, Polaris 850 Switchback Pro-S and Yamaha Sidewinder SRX LE and Ski-Doo Renegade 850 E-TEC – four full-featured speed demons with your name on them. * Tech 2019: The inside scoop behind the new Polaris 850 Patriot, Ski-Doo 900 ACE Turbo engine, Arctic Cat Alpha One rear suspension and reintroduction of the SRX package. 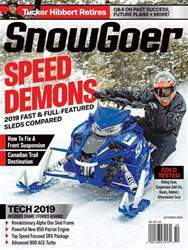 Plus full-season sled review, a flashback to the 1964 Mathews Trailmaker, how to replace an A-arm, product upgrades and more in the October 2018 issue of Snow Goer.